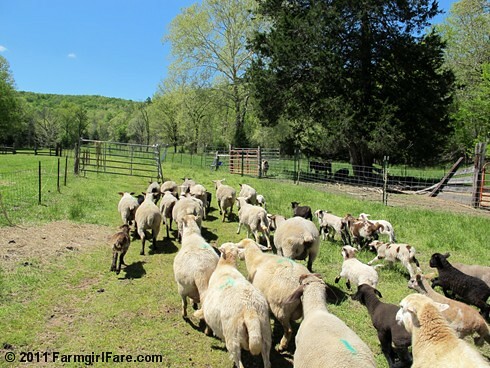 Farmgirl Fare: Friday Dose of Cute: Sheep Freedom Day! The sheep are always excited. . .
More photos and a much longer than planned story below. . .
Once they figure out where it is they're going. Around the middle of February each year, when there's ice and snow on the ground and not much of anything left to eat in the fields, we lock the sheep up in large pens and feed them grain treats and square bales of organic hay we put up the previous summer. Joe's rule is that everybody who eats grass must be off the fields by March 1st, which is when the growing season begins. It's also the same time that large numbers of deer mysteriously appear like clockwork to graze on those very same fields. During sheep breeding season, which usually starts around November 1st (so the lambs will begin arriving around April 1st), we separate the flock into two groups: the bred ewes and older sheep who need extra food and TLC during winter, aka the pregos, and everybody else, aka the non-pregos. These would be ewes too young to breed, ewes we aren't breeding, butcher lambs we're raising up, and my, ahem, growing collection of large pet wethers. The two rams stay with the pregos (which we separate into two groups, one for each ram) for about a month, and then they're moved to their own pen near the barn. The pregos live in the barn and the attached barnyard, which is about 1/4 acre, and the non-pregos live in an acre-sized pen, which has two large shelter huts in it, located across the driveway from the barn.The non-pregos get fewer treats than the pregos, which they like to constantly—and loudly—complain about. But sometime around the end of March or the beginning of April, the non-pregos become the lucky ones because we let them out of their pen so they can wander around and nibble on tender young greens in the woods and 'non-field' grassy areas by The Shack and barn. This also gives the grass in their acre pen a chance to grow. The prego group—which by now is the new mom and lamb group, although we usually just keep calling them the pregos—gets stuck with hay (and extra treats). The longer we can keep the sheep off the fields, the more grass we'll have to feed them for the rest of the year, so we try to wait until at least May 1st before we let the moms and lambs out in the front field to graze. If the hay holds out, we wait until the middle of May, which the moms like to constantly—and loudly—complain about, since they can smell all that new fresh grass surrounding them. When the energetic lambs threaten to bounce right out of the barnyard and/or the hay runs out, we let the moms and lambs onto either the large (hopefully very) grassy pen adjacent to the barnyard, or the (hopefully very grassy) non-prego pen across from the barn. This allows the lambs to get used to being in an open area while still being contained. At night they're all locked up in the barnyard, lured back in by treats. We call the moms' and lambs' first day out on new grass Sheep Freedom Day, and last year it coincided nicely with Mother's Day, so we had an All You Can Eat Mother's Day Buffet. This year things were a little crazy and a lot less official, since we ended up having to move the moms, lambs, and remaining pregos into the (not very grassy) non-prego pen one evening during last month's flooding, since the barnyard was a big soupy mess, and the barn was precariously close to flooding. Actually, there was no 'we' about our spur of the moment Sheep Freedom Night. Joe drove the tractor across the creek and moved everybody, including 30 clueless, freaked out lambs, plus all the hay and treat feeders himself, in the pouring rain. There may have been shouting involved. This was all a roundabout way of announcing that Sheep Freedom Day 2011 occurred on May 6th, when the moms and lambs (and my 15-year old pet wether, Big Chip) were allowed to race down the driveway alley and into the green front field. The non-pregos are still running around loose—protected by our livestock guardian dogs, Daisy and Marta Beast—although they've taken to hiking out to Donkeyland and spending most of each day munching down the donkeys' grass. With all the wonderful rain we've been having (it's once again pouring as I type this), there will hopefully be enough to eat for all. Want to learn more about life on the farm? © FarmgirlFare.com, where it's all about the food. The fields are gorgeous! The deep, rich green of vitamin-rich, fast growing grass! Glad the flooding has stopped for you. Oh these photos are so beautiful! It looks so idyllic (are you through laughing now??) - I know - just from reading this post - that your farm life is anything but idyllic!! Nonetheless, thank you for sharing these wonderful pictures and the great description of "Sheep Freedom Day!" That grass looks good. Everyone should be very happy.